The B' class, Anastasios Sevasti Hotel is found in the town of Mykonos, 2 minutes for the center of the town. 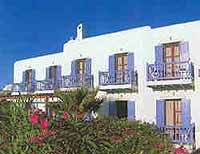 Constructed in 1985 and renovated in 2000, the Anastasios Sevasti hotel has 41 rooms and 1 suite. Built in a quiet area, the Anastasios Sevasti was designed in traditional Mykonian architecture with a view of the famous Aegean Sea and the town of Mykonos. All rooms have a balcony or veranda with view of the garden and the beautiful Mykonian Sea. The rooms of the Anastasios Sevasti are also fully equipped with Bath/shower, two-way air conditioning, refrigerator, hairdryer, ceiling fan, telephone, music, satellite TV., safety box and voice mail. Facilities and services at the Anastasios Sevasti hotel include: a pool, gym, lounge area with bar, television room, buffet breakfast room, reception, snack bar, safety deposit boxes and private parking. Pets are allowed and baby sitting can also be arranged. The Anastasios Sevasti also has facilities for persons with special needs. from the beach: 0.4 km.